Advance Australia filet crochet pattern. Note: This pattern uses Australian/UK crochet terms. Double crochet = US single crochet, Treble = US double crochet etc. Can you imagine anything more cosy than a softly crochetedswool cushion snugly placed in your favorite chair? The original cushion illustrated was crocheted in two shades of green, the background being crocheted in dark green with the “grape” design standing out in light green. Many may prefer the cushion throughout in one color, which of course simplifies the working. This stitch works up beautifully into pram and cot covers. Using white and pale blue wools for preference. If the “grape” design is to be in contrasting shade wind the wool into small balls, each containing about 2 3/4 yards; this being sufficient to finish each group, and can remain at the back of work when not in use. 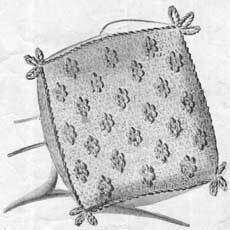 (Examine diagram of stitch.) Having one loop on hook, insert hook under 2 strands of D.C. 3 rows below, (taking care that D.C. picked up are DIRECTLY below.) Draw up loose loop about 3/4 of an inch long. Repeat this twice more keeping all the loops on hook. Wool over and through remaining loop. This will be referred to as “1 grape” throughout. Old UK No. 6 Crochet Hook. 3/4 Yard material 27 inches wide. Commence with chain of 118 in dark green 1 ch. to stand for 1st D.C. throughout. 1st Row: 1 D.C. into 1st ch., 1 ch., miss a ch., 1 D.C. into 3rd ch. Repeat from * to * (59 spaces). 2nd Row: 1 D.C. into 1st D.C. of previous row * 1 ch., 1 D.C. under next ch. * Repeat from * to * all along, working the last D.C. into last of previous row to keep edge perfectly straight. 3rd and 4th Rows: Same as second (59 spaces). 5th Row: Work * 14 spaces dark green as before, join in light green. Work one grape, then pass light green to back *. Repeat from * to * twice more, 14 spaces. Turn. 6th and every alternate row, same as second (59 spaces). 7th Row: Work 13 spaces dark green *. Pick up light green, 1 grape, 1 ch., 1 D.C., 1 ch., 1 grape. Pass light green wool to back 12 spaces dark green *. Repeat from * to * twice more but finish row with 13 spaces. Turn. 9th Row: Same as 5th, working the grape into top of 1st grape as illustration shows – i.e., into the stitch that holds all the loops together. 11th Row: Same as 7th row, working into top of previous grape as before. 13th Row: same as 5th row, working into top of previous grape as before. 14th, 15th, and 16th Rows. – Same as 2nd row. 17th Row: Commence 4 groups of grapes to come at ALTERNATE POSITIONS to the previous three groups. Continue in this manner until cushion is square. The next group of grapes being three (as first three) then four again, and so on to end. Prepare well filled cushion, then make up, finishing with cord. If the back of cushion is to be of crochet twice the amount of wool will be required.